Lopa Kothari presents new tracks from around the world, and a studio session with bluesman Charlie Parr. He comes from Duluth, Minnesota, and writes songs in a country-blues style. Lopa Kothari with new tracks from across the globe, and a studio session with American bluesman Charlie Parr. 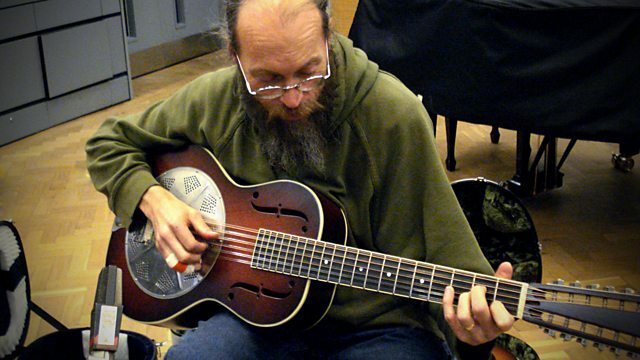 Charlie Parr comes from Duluth, Minnesota. He writes songs in a country-blues style, and accompanies himself on a National resonator guitar. Of his songs, an American reviewer wrote, "chunks of coal mined by genius shine like diamonds.". Ektaar Music CD003 Track 2 (4:44). Green Queen Music 0206138GQM Track 2 (4:32). Sound Way CD026 Track 3 (2:45). Internet only release http://mshwarmounir.com/ (3:00). Musica Almaya NUR 001 Track 10 (3:58). Ektaar Music CD 014 Track 8 (3:42). Dixie Frog DFGCD 8699 CD 2, Track 14 (3:50). Norsk Kulturrad EM87 Track 1 (4:06). Alama Records ALAMA002 Track 2 (4:00). Grava Samba 60252758742 Track 11 (5:04). Tremolo TMRL 001 Track 6 (3:32). Salim Khan presents Soyachan pakhi. Salim Khan presents Bhondi Dhonnamoy. Mon Slip MS 122 Track 9 (3:40). Stage Three Music LASTL010CDP Track 1 (4:10). DP CD 148 Track 1 (7:00.